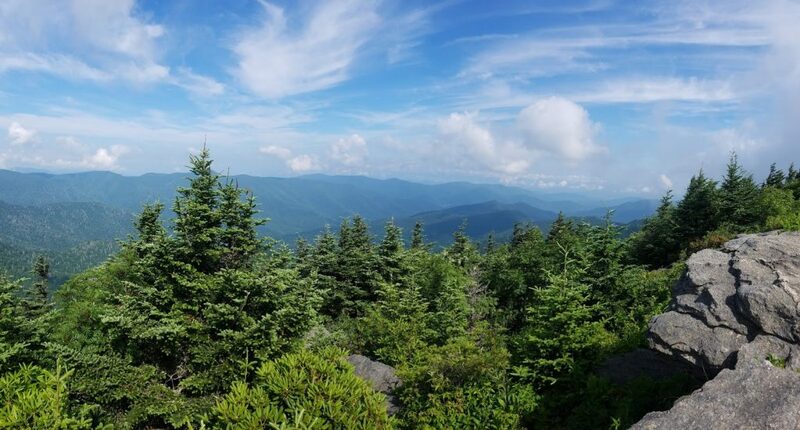 The Deep Gap Trail in Mount Mitchell State Park has it all, from breathtaking views to breathtaking altitude. Starting at the highest peak in the United States East of the Mississippi and winding its way up and down an assortment of ridges and gaps, this trail can be tough. 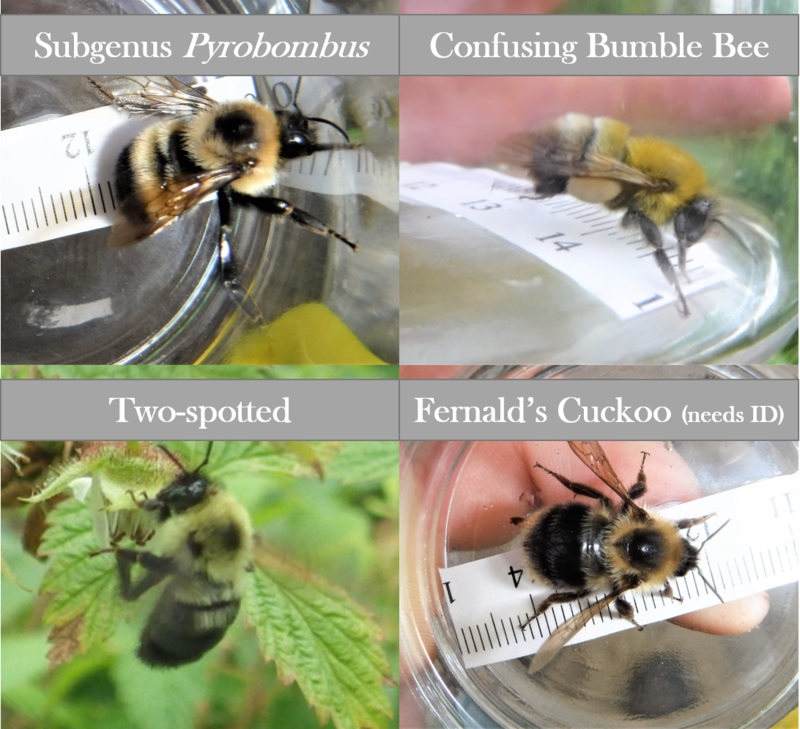 Luckily, the Citizen Scientists involved in the Search for the Rusty Patched Bumble Bee are up to the challenge! Since the Rusty Patched Bumble Bee was recorded here last century, this was a priority location for us to search. 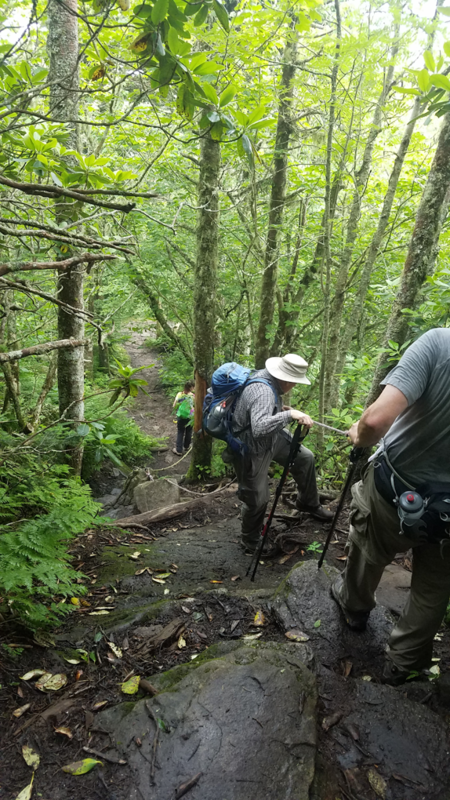 On Saturday, a handful of volunteers escaped the heat and headed into the the foggy coniferous forest that makes up the unique, nearly alpine, ecosystem of Mount Mitchell. This cool forest appeared otherworldly at times with the dark Fraser firs surrounding us from the moment we left the parking lot. Even on a hot day in late June, temperatures in the forest hovered around 60 degrees Fahrenheit, typical of this time of year at that elevation. While it is difficult to imagine something as solar dependent as Bumble Bees could thrive here, their adaptations for cooler conditions keep them buzzing despite their damp surroundings. 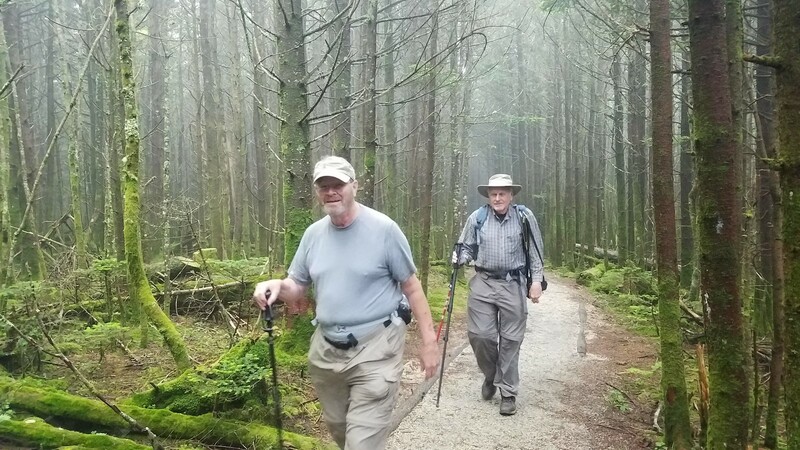 The Deep Gap trail we took begins near the peak of Mount Mitchell at an altitude of 6,683 feet. Then, it climbs up to the top of Mount Craig before dropping and peaking once again to Big Tom Mountain. The trail moves between dirt and rock and occasionally forces its hikers to become climbers, offering ropes to assist them on some of the steeper stretches. While these changing conditions proved to be quite the workout, they gave us time to really appreciate our scenery. Of course, the towering peaks around us were impossible not to notice but it was the smaller features that made this such an interesting hike. Plants like Saxifrage are able to grow in the smallest crack in the rocks while just to the side, berries provide spring blooms for pollinators and a valuable fall food source for black bears. While walking, we even saw a track of one of these bears, perfectly placed in the center of the trail as if to remind everyone to keep an eye out. While we did not stumble across any wildlife larger than Mount Mitchell’s many bird species, we did see plenty of pollinating insects. Berry flowers were at their peak, blooming later than their lower-altitude counterparts due to the cooler temperatures higher up. While the elderberries and blackberries are attractive to all, the mountain cranberries seem to be a special target of the Bumble Bees living in Mount Mitchell State Park. The tubular, red flowers of the cranberry can only be pollinated by buzz pollination, a technique perfected by Bumble Bees that allow them to “skip the line” and avoid competition with insects that cannot buzz pollinate, including Honey Bees. 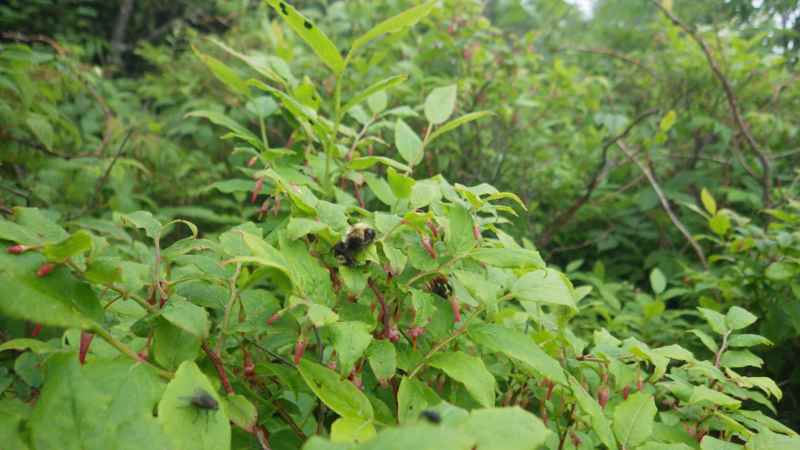 During our hike, it appeared each of the frequent stands of Mountain Cranberry had at least one Bumble Bee making its way through them. Because these bushes grow low to the ground and the flowers face downward, we were often forced to sit or even lay down on the rocks to successfully capture a Bumble Bee. Our antics often attracted the attention of other hikers on the trail. These passersby were curious, leading to several conversations about what exactly we were doing and how important Bumble Bees are to our ecosystems.You never know what conversations you might get into on a trail! While there was a good number of individual Bumble Bees along the trail edges and passing under the trees, only a few species were successfully captured, including memebers of the Subgenus Pyrobombus (Bombus vagans or sandersoni), Confusing Bumble Bee (Bombus perplexus), Two-Spotted Bumble Bee (Bombus bimaculatus), and a species of Cuckoo Bumble Bee (potentially Bombus flavidus). The steep trail made catching Bumble Bees difficult as they can fly much quicker than we can climb. Because of the often changing conditions at the higher altitude, Mount Mitchell remains a priority location for our search.